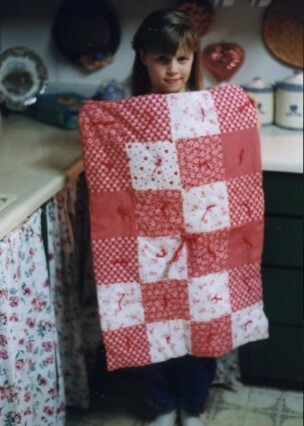 My love for sewing started when I was young. When I was very little, my siblings and I drove my mother crazy digging through her fabric stash. I remember that our favorite hiding spots were all in her sewing room. We’d pull the fabrics out of the cabinets and climb inside to hide. We would often sit on the floor of her sewing room after hide and seek, playing with her scraps of fabric, pretending to make things out of them. Each piece of fabric that we came across was like a piece of gold, a treasure to be hoarded. My first attempts at sewing were as a four-year-old child when my mom brought home one of those small, chintzy, plastic sewing machines that are meant to help teach children to sew. I remember she brought it home from Jo-Ann Fabrics after one of her solo trips to the store. I LOVED the sight of that machine. It was a sewing machine AND it had a bunny on it. (Bunnies were my favorite animal.) Yet those little machines are cheaply made, and that made it next to impossible to actually sew on. I remember coming to tears in frustration, and my mom telling me it wasn’t supposed to be that hard. She let me sit on her lap while she whirred away on her machine, me watching in complete and total fascination. And for me, that was it. I was hooked on sewing for life. Between the ages of 4 and 7, most of my “sewing” consisted of cutting out fabric to make doll clothes, and then my mom helping me sew them together. The dolls always looked like they were suffocating… I had zero understanding of what a seam allowance was until my dad explained to me how the fabric needed to be cut larger for the sake of sewing the pieces together (they’ll “shrink” once sewn together), and how clothing needs to have give and room so that it’s not too tight. Well, that was just what I needed to move my sewing career to the next level. It was at about this age, 7 years old, that I was allowed to do a little sewing “by myself” (with a high dose of Mom’s close supervision). For maybe my 7th(?) birthday, I was given a sewing basket as a gift, and a kit that had dark pink scissors, seam ripper, seam marking tool… and then there were pins and needles and mom even put some buttons into that sewing basket for me. I’m pretty sure that I still have those buttons (or at least some of them) because I just couldn’t bring myself to use my “fancy” new buttons! Mom taught us all how to sew, even my brother. We used so many different machines, that I got used to using a treadle machine, old table machines (built into the table), but we weren’t given free-range over Mom’s machine. That we could only use with her constant supervision. We used a lot of second-hand machines (after all, a new one would be really expensive), but at some point, they all died and we ended up getting a lower-end machine just for us kids. That machine was absolutely amazing to us! It had so many different stitches, and it had the automatic buttonhole, which was JUST. SO. COOL! We made a lot of terrible doll clothes between the time I was 7 and 9, but Mom kept training us to do better. She’d show us little tips and tricks here and there. She worked to teach us how to use a pattern. I remember that the first time I used a pattern, it was to make an outfit for my Cabbage Patch Dolls. I remember which pattern package it was in, but not the outfit that I made… go figure! We had Cabbage Patch Dolls, Barbie Dolls, and each of us girls had one American Girl doll. I had Kirsten because she looked the most like me. And we made clothes for them all, and blankets! There are a few projects I made when I was younger that really stood out in my mind. 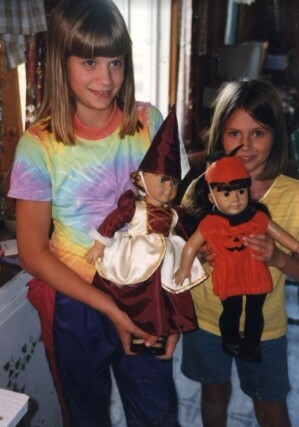 There was the year my younger sister and I made Halloween costumes for our American Girl Dolls. That costume was SO challenging for me, but I felt so grown-up adding all of the embellishments to the dress, and I did the whole thing myself, without any help from my mom (well, if she did help, aside from answering questions, I’ve forgotten 🙂 ). That’s me on the left holding the princess doll. My younger sister is on the right holding the doll in the jack-o-lantern costume. I did mine solo, she had a bit of help from me, but it was mostly all her own doing. Look how tiny we were! There was a small Valentine’s quilt that I made for some of my dolls. That quilt was so exciting because I was allowed to pick out some of Mom’s fabric that was NOT just her scraps. That was a really big deal. And it was my first time ever using batting. Right around that point in time, my sewing projects really started to take off. Mom taught us so much and really blessed us by allowing us to play around with it so much. Sometimes she helped us, and sometimes we just helped her with parts of a project. There were shorts and t-shirts and Halloween costumes that we took part in, to one extent or another. I always felt drawn to making clothing. I think it just felt like the possibilities were endless. This Valentine’s quilt is still in existence today, and is now being used for Miss Lady’s dolls. Then one year, Mom came home from the quilt shop with a book in hand and told me she signed me up for a quilt making contest. I was so incredibly excited to make something that was more than just a patchwork quilt. We chose a design from the quilt book, “Brittany’s Teddy Bears,” and I ended up winning a prize: plastic quilt block templates, some felt grips for the templates so they wouldn’t slide, 2 rolls of batting, and I think there was some fabric as well, and maybe a quilt book… my memory has gotten fuzzier with each child we’ve had! I kept the templates for myself, and I used one of the battings for a project not long after, but I stored away the second one and gave it to Mom as a Christmas gift that year. It felt so good to be able to give my mom a gift that was so… grown up! 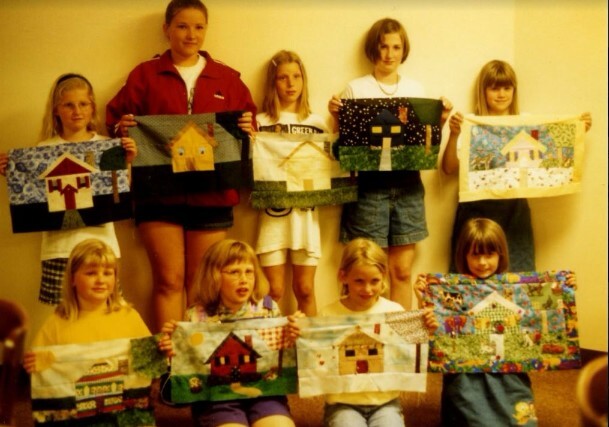 During Middle School, my mom took my younger sister and me to some quilt day workshops for kids. We went to two of them, and what a thrilling experience! We met some new girls (we were shy, but still, we met!) and sewed for the afternoon. The first year we went, the project was a small wall-hanging of a house. It was a good piecing project, and it got us more familiar with how to do a quilt pattern. The second wall-hanging was easier, featuring 8 9-patch blocks, and we had to make appliques and put them on the quilt. 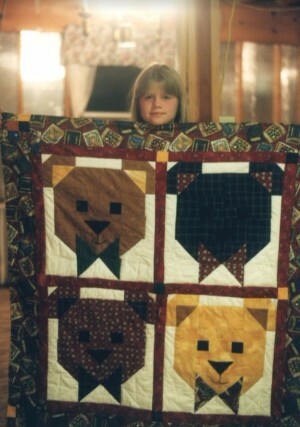 Mom definitely did the quilting on that one, and she helped me a great deal with the applique. Both of those experiences were so much fun for me. I’m not sure how my younger sister felt about them, but I enjoyed it! By the time I hit 8th grade, I started buying fabric with money I earned babysitting and cleaning my grandparent’s pool, and was starting to make clothing on my own. This was monumental for me. I really did not enjoy using patterns, and around this time, I decided I’d do better without them. I would maybe use a pattern as a reference, but I’d often ditch the pattern part way through the project and figure out how to finish it on my own. That summer, I spent a lot of time learning how to work without a pattern at all. By the time Freshman year of High School rolled around, I designed my first dress… no pattern involved, for the Homecoming Dance. After that, it was just expected that I’d make all of my dresses for the dances, and I pretty much did, and again, all without patterns. Because I felt like patterns were just too frustrating. All throughout high school, I was improving and refining my skills. I remember my sewing classes in high school well. There were maybe 2 or 3 other girls in the classes that knew anything about sewing. A strange turn of events from what my mother grew up with. When she was a girl, she was told that she’d learn how to sew when she was in high school. When she was in high school, she was one of the only girls without much prior sewing experience. And they had a tailoring class. My sewing classes consisted of a simple quilt, some pillows, a skirt, a backpack, and mittens. Oh, and some pajama pants. While it was certainly challenging enough for a good portion of the girls in my class, I was always finished first and had nothing to do until the next project would start. This was when I got my first taste of teaching sewing lessons by assisting the teacher and helping the other students with whatever they needed. The summer before my senior year of High School, I got sick of school. My brother was one of my closest friends, and he graduated two years before me. We had a group of friends in the grade between us (one being Tiffany, my best friend), and when they graduated, I realized I just couldn’t bear another year of school without these people, taking classes I didn’t want to take, learning about things that I couldn’t care less about. I remembered something the guidance counselor tried to gloss over when we were signing up for what classes we wanted to take the following year… that it was possible to graduate early. When I realized this, I jumped on the opportunity, and called up the guidance counselor, talked with the principal and varying teachers it would affect, met with the school board, and was granted approval to graduate early. I COULD NOT WAIT for January to arrive. Right before my senior year began and it was time to get new clothes, I asked my parents if it would be alright if I got some money for fabric so that I could make my own clothes that year instead of buying them. And I did. Somewhere between Junior and Senior year, my skills really took off. I started gaining a better understanding of how fabric works, why clothing is assembled in a certain way, and I started to really pay attention to the terminology. 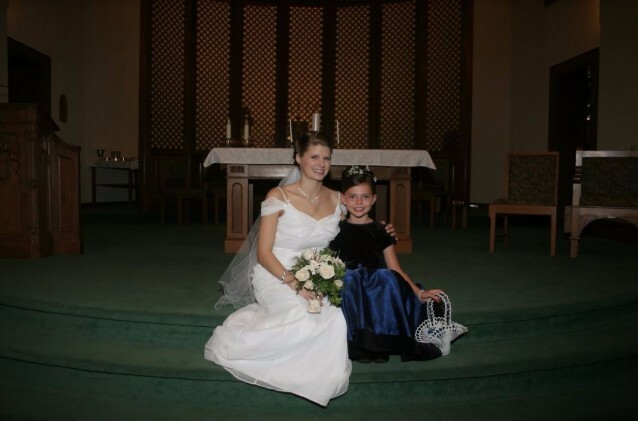 It was that year that I was hired to make a First Communion dress, to make alterations on a bridesmaid dress, and to hem my first pair of pants (for a customer). I was also hired to teach sewing lessons to one of my friends younger sisters. They were all really great learning experiences for me, and I’m still shocked to this day that anybody hired me to do those things! The faith that those people put in me was really what I needed to take my work to the next level. Funny story… remember how I said I needed to get better at the terminology? When I was called to hem that pair of pants, I don’t remember who it was for, but they called and said “Would you be able to hem a pair of pants for me? I think that’s the term for it, right? To hem?” They probably heard crickets chirping on the other end of the phone while I wracked my brain to figure out what they were talking about. Finally, I remembered that indeed, it was, and I mustered an “Oh, yes. Yes, that’s right. I should be able to do that.” I got off of the phone and had to double check with Mom. At this point in time, I was planning to get a job after high school doing alterations at a bridal store… I sort of had something lined up.. but it was then that I had to really up my game and start remembering all of the terminologies. Just after my 18th birthday, the first semester of the school year ended, and I was home free! I took the first week or two off before I buckled down to find a new job. The one I had my eye on at the bridal shop fell through, so I would have to look elsewhere. Problem was, there aren’t all that many places you can get employment as a seamstress. I tried another shop that I knew did alterations downtown, but they were kind of rude, and not hiring. At this time, Scott and I had been dating for months, and he was helping me on my job search. He came with me while I looked for places to work. He had done a lot of research online and found another seamstress downtown, so we stopped in to ask for an application. She said they weren’t looking to hire anybody, so we left the shop, me feeling rather defeated. Scott encouraged me to put together a portfolio of my work and to bring it back to the different shops to show them that I was both serious and capable. I started with the last shop we had gone to as she seemed the friendliest. I got some really amateur shots of me modeling all of the clothing I had made throughout high school, along with some of my other work, and put together that portfolio. This time I went back to the shop, alone. I sat down with Sue, and she hired me right away. It was a commission job, getting paid per piece, not by the hour but it was a job, and exactly what I was looking for because it would be good training. At the time, I was unsure what my future would hold, and I had dreams of (possibly) designing clothing someday… mostly because people kept telling me that I needed a backup plan for becoming a stay-at-home-mom, and it was easier to tell them that I wanted to get into clothing design. When I started working for Sue, she was really impressed by what I all knew, how quickly I caught on, and how willing I was to learn. Sue taught me so very much. My mom had instilled in me a love of sewing. My years and years of watching her work taught me many different skills and techniques and gave me the foundation for all of my other sewing skills yet to come. While working for Sue, I learned how to do alterations on clothing really well. She did all of the formal wear, and I focused on everything else. I was able to make a decent amount of money in that job because I worked so quickly. I would go to the shop and work, which meant I never ran out of things to work on. In the unusual circumstances where I did run out of work, I would clean up the work area or the shop area downstairs. I also started training to work with customers (on those occasions, I’d work hourly), and also train on how to work on the formal wear. Months into my new employment, Scott and I got engaged which meant I’d be needing a wedding dress. And my bridesmaids needed dresses. And so did my flower girl. My older sister also got engaged around the same time (her wedding was going to be 4 months before mine), and she wanted specific fabric for the dresses, so each bridesmaid had to take care of getting her dress made. I ended up making two and helping with some adjustments on others. As soon as the dresses for her wedding were taken care of, I got cracking on the dresses for my wedding. I’m definitely happy with how my wedding dress turned out. It was definitely quite the experience making it! My dress was relatively simple, no fancy bead-work or lace. The only embellishments are some clips on the front of the straps, and “pearls” in the straps. The dresses didn’t all turn out exactly as I planned, at least not the bridesmaid dresses, but overall, I was pretty happy with the results. At least I was really happy with my dress! After the wedding, I continued my job as a seamstress, working there “full-time” until we had Pumpkin. At that point, I began working part-time, mostly out of boredom, and I usually brought it home. Eventually, I started to take on more and more work at home through the people Scott worked with and also from the people in our community. I kept at it, taking less and less work from Sue because I just wasn’t heading into that city anymore (we lived between two cities, and I had to do most of my errands in the other city where Scott works) and because she was getting ready to sell the business. I’m not sure that saying I made a living off of my sewing is quite accurate as I could never have lived off of what I earned, but I certainly could have if I had striven to get enough work to do so. Me and my flower girl. When we moved to our first house, I kept sewing on the side, always from home. Sometimes I’d have a lot of work, and others, nothing. I didn’t worry too much about it because we really didn’t need the income, but it did give me enough money to work on the odd project around the house or to get fabric for my own sewing projects. Once we had Doodles though, I pretty much quit. I stopped advertising and started turning work away. Having wedding dresses in the house with 4 little kids around was just terrifying. I’d take on the odd job because I knew the person asking well, or because I knew how difficult it was to find people who could do alterations. By the time we moved to this house, I really only did work for others in rare circumstances when I randomly felt like accepting the work, or if I knew how urgent it was to others. To be completely honest, I got to a point where doing sewing work for other people started to feel like such a burden. I had so little time to work on my own projects that it was disappointing to have “free time” and to have to put it towards somebody’s alterations. Now, if I took on work for you during those years, don’t feel bad about it. Don’t think you burdened me. It was something I had enjoyed and eventually just lost a spark for. I really was to a point where I was only taking on work that needed to be done for a close family member, or that was enjoyable to me. It took a while after the move for me to get my drive for sewing back. Suddenly, I found myself wanting to sew new pillows for the couches, to make a dress for Miss Lady, make a maternity dress for myself, and work on other projects, just for fun. It was during this time that I came to fully understand the scope of my knowledge about sewing. While we still lived in the old house, I rediscovered a desire to quilt, at least once in a while, and lately, I’ve been doing a little more sewing for fun. It’s actually been nice writing about sewing for the blog, because it has given me a fun reason to sew on a fairly regular basis, and it’s helped me to break down what I need to do to teach my children how to sew. They don’t do too much yet, but they do more than just about any other children these days! I can look back now on all of these experiences, all of the learning and growing I did, and see that I really am somewhat of an expert. I still feel weird saying it though, because I know how much more I don’t know. I know I can improve on things. I know I can always do better. And I guess that knowledge will keep me hooked on sewing for life. It’s always good to know that we can learn more and do better! I’m having a hard time getting any pictures uploaded for this post, so I guess you’ll have to take my word on it! How many of you feel that way… that you aren’t an expert at something that you’ve been doing well for years? I know I’m not alone in that! I’d love to hear about what you are good at! Right now, I am a part of the Handmade Christmas Gift Boot Camp as an instructor for a Potholder Mitt tutorial. The boot camp is designed to teach people how to make a variety of handmade gifts (from soap to hard cider and lots more) and to keep you on track to get your Christmas Gifts completed on time this year! Click this link to find out more! What a cool post! I enjoyed hearing about your journey–so far. Eventually there will be a homesteading story, a homeschooling story, a chicken farmer story, etc. etc. You are a fascinating gal, Danielle. Thank you, Sue. Yes, someday, there will be a lot more stories to tell! I wish I had only studied home ec courses in school! It never occurred to me back then that sewing, cooking, needlework, and crafting would bring me so much joy. My true passion is Bible teaching. I think a lot of people feel that way. I know there were lots of people I went to school with who skipped the “easy” classes like cooking and sewing because they felt they weren’t worthwhile when it came to education after school. But it’s like you said, they are now finding out how much they actually enjoy these things and only wish they would have started with it all sooner. That’s great that you’ve found something like Bible teaching as your passion. I think in some ways, teaching as a whole is a passion of mine, but I never had any interest in being a school teacher. I really enjoyed reading this. It’s amazing how much experience you’ve had at such a young age! Well, thank you! It’s amazing how you can go through life not knowing how much you really know about something until you take the time to list off what you do know on the subject! I’m glad you did that! Thank you for the sweet compliment, Kathi. Yes, I need to do a thorough tutorial on that one binding method. I just didn’t get the pictures that I needed to explain it all properly. That’s great that you’re improving though… we’d never get better if we didn’t admit that there’s room for improvement! Thanks, Michelle 🙂 I admit, sewing does not come easily to everybody! I will most definitely be passing on these things to my children and grandchildren. In fact, tomorrow when I go to work on one of my posts, I’m going to have it be a sewing lesson day for the kids as well.